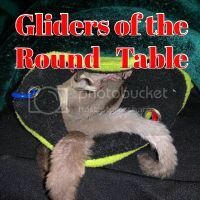 Register Log In GliderCENTRAL Forums Bonding & Relations Class pet? I recently adopted a male sugad glided (6 year male) from a family friend, and i was wondering if it would be ok to take it in as a vet AND ANIMAL SCIENCE class pet. the people in this class are all seniors in high school that plan on persuising a career in animal science and have a love for animals, so im not worried about the class bothering or disturbing it. I would take it home on the weekend so it can socialize with me still on the weekend. i tried this for a day on friday and didnt seem to mind and continued his normal schedule (aka sleeping during the day). Is this a fine idea? He would be happier, & bonding with you would go faster, if he could be around you every evening. They're social animals, weekends only would be insufficient if he's left alone in an empty classroom all night. I would ask you to consider two things: He may have slept, but did he sleep well; how good of a class pet will he make if he sleeps whenever students are around? Also, your other post mentioned you're still working on bonding with him. I would encourage you to wait on this decision until after you're comfortable with each other.